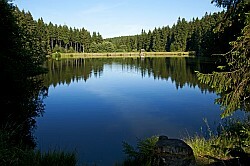 Pictures - Campingplatz Polstertal, camping im Harz. Click here for a video from the air! Click here for panorama pictures (360°)! Fun for kids (and adults up to 200 kg). Polstertaler Teich (little lake for swimming and fishing).